I'm making good headway on my ZKIT and have about all the parts I need (just got the 100 ohm resistors, and still need to get a 3 prong cord for the power transformers). I ended up buying #4 woodscrews to mount the PCB, and as those have a coarser thread than the standoffs I ordered I don't think they'll work together. Would an aluminum spacer work ok, or would that be too conductive? Aluminum spacer, #4 wood screw, or any metal bolt are all pretty much the same conductivity. Any should work fine in this application..."too conductive" should not be a problem. Thanks! I eventually to some #6 standoffs and screws for the circuit board, and used the #4 screws for the output transformers. 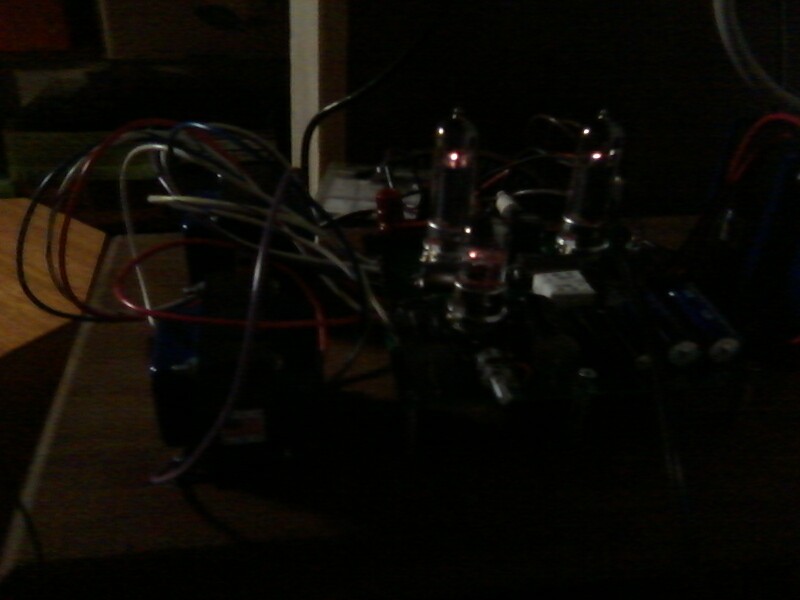 Need to get some shorter #6 screws to attach the power transformer, but it's up and running! Bad shot, but it's no prettier well lit.